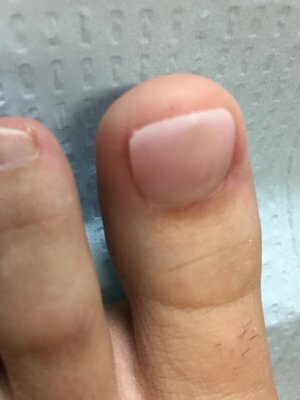 Do you have damaged, crumbly or missing toenails? Ask our technician how they can beautifully restored with UV resin nail gel! Call for our location nearest you- 878-313-3338. 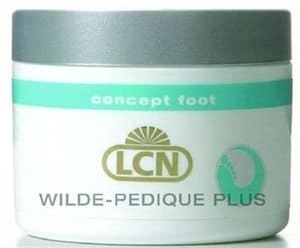 Barefoot by LCN, a true breakthrough in cosmetic toenails. Who would use an artificial toenail? Any one who shows off their toenails in summer sandals. LCN Barefoot is the cosmetic toenail industry’s only gel system specifically designed for use on toenails. It adapts to your toes own movements because it is a very elastic UV/LED gel. These very unique adhesive properties allow good results even on calloused skin layers and where there is not even a toe nail at all! Because the nail gel is non-porous, nail polish, gel polish and acetone nail polish remover can be used without damaging the artificial nail. Barefoot is available in several colors including natural pink, Tan, Opaque, and White Diamond shades. The Artificial nail can match any nail length and shape and provide coverage even across all ten nails to leave them looking fabulous. Even the most unsightly nails can look great!. Wilde Pediseal is an elastic light cured sealant to complement and finish the process of our barefoot products. It is designed exclusively for toes, and comes with UV protector. 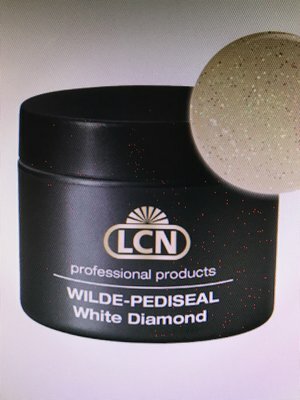 White Diamond Pediseal is enriched with glitter particles. These inherant particles sparkle beautifully in the light and are just right for adding sparkle to that special occasion. The clear gel formulation moves with the toe. White Diamond is applied easily and will not run into the nail folds. Its UV protection can stabilize a sophisticaqted permanent French manicure and colors. It protects Barefoot pedicure gel in the summertime from extreme exposure to light as in tanning beds, the beach, or sun bathing.